The Rhode Island Department of Environmental Management (DEM) announced today it is stocking some 75,000 brook, brown, and rainbow trout into Rhode Island ponds and streams in advance of the freshwater fishing season. Opening Day of the season, set for Saturday, April 13, is celebrated annually by more than 40,000 anglers across the state. "Every year on Opening Day generations of Rhode Islanders head out to a favorite fishing spot to experience the thrill of reeling in the first trout of the season," said DEM Director Janet Coit. "DEM is proud to support freshwater fishing through our stocking program so that anglers of all ages can experience our beautiful freshwaters and have fun catching beautiful hatchery-raised trout. 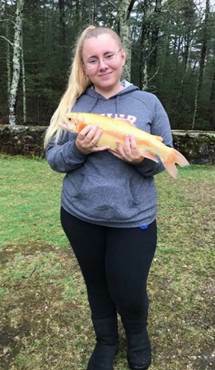 And this year, the gorgeous golden rainbow trout we're stocking in local ponds for Opening Day will bring added excitement to this time-honored Rhode Island tradition." New this year, hatchery-raised golden rainbow trout are being stocked at 16 of Rhode Island's most popular fishing locations for Opening Day. These trout are a color variation of a rainbow trout and provide an exciting angling experience. For locations, visit DEM's website. Anglers who catch a golden trout from Opening Day through April 29 will receive a free golden trout pin. Take a picture of your catch and send it to dem.fishri@dem.ri.gov. In addition, DEM will be stocking one monster golden trout weighing at least seven pounds in one of these locations. The location is secret, but the lucky angler who catches it will receive a special prize. The fish must be weighed at a certified official weigh station with a digital scale, and a picture must accompany the application for a state record. For a list a of official weigh stations, click here or contact Aquatic Resource Education Coordinator Kimberly.sullivan@dem.ri.gov. DEM's Division of Fish and Wildlife is stocking hatchery-raised trout with an average weight of one to one and a half pounds in more than 100 waterways across the state. Popular locations include Olney Pond, Lincoln Woods State Park, Lincoln; Meadowbrook Pond, Richmond; Silver Spring Lake, North Kingstown; Stafford Pond, Tiverton; Shippee Sawmill Pond, Foster; and Round Top Pond, Burrillville. This year, Dundery Brook/Wigwam Pond in Little Compton will not be stocked due to bridge damage. Click here for a complete list of stocked waters. Cass Pond in Woonsocket, Slater Park Pond in Pawtucket, and Ponderosa Pond in Little Compton will be open to young anglers only on the first weekend of the freshwater fishing season. On Saturday, April 13, and Sunday, April 14, a children's fishing derby will be held at Ponderosa Park Pond in Little Compton. Thanks to the partnership of the South Kingstown Land Trust, Scott Evans Memorial Pond (Biscuit City) in Kingston will be added as a children-only pond and stocked for Opening Day of trout fishing on April 13. Located on Ledgewood Road, the pond is in a restored historical area that includes hiking trails, natural plantings, and ruins of the old Biscuit City Mill. The South Kingstown Land Trust has installed informational kiosks and a universally accessible fishing bridge on the property so that children using wheelchairs can access the pond to fish. oPonderosa Pond, Little Compton, are restricted to children-only for the first two days of the season, April 13 and April 14. As part of a larger network of recreational opportunities in the state, fishing plays an important role in connecting people with nature, promoting health, and attracting tourism. According to the American Sport Fishing Association, recreational freshwater fishing contributes more than $36 million to the state and local economy each year, based on consumer spending on trips, gear, and other related purchases. A 2019 fishing license is required for anglers 15 years of age and older. A Trout Conservation Stamp is also required of anyone wishing to keep or possess a trout or to fish in a catch-and-release or "fly-fishing only" area. Trout Stamps are not required for persons possessing trout taken from a lake or pond that shares a border with Rhode Island. Fishing licenses can only be purchased online at www.dem.ri.gov/huntfish. Online fishing licenses and the Trout Conservation Stamp also can be obtained via an authorized agent. Here is a current list of licensed vendors. Anglers are encouraged to check the list before visiting a vendor to purchase a license. License fees are $18 for Rhode Island residents and current members of the Armed Forces, $33 for a combination hunting and fishing license, $35 for non-residents, and $16 for a tourist three-consecutive-day license. Licenses are free for anglers over 65 (Trout Stamp not required) – as well as for those with a 100-percent disability. The daily creel and possession limit for trout is five from April 13, 2019, through November 30, 2019, and two from December 1, 2019, through February 29, 2020. The use of external felt soled or any natural or synthetic porous material capable of absorbing water in any freshwaters in Rhode Island is strictly prohibited. This includes any waters shared with adjacent states in which Rhode Island fishing regulations apply. For more information on preventing the spread of aquatic invasive species, which can be transported in felt soles or other porous materials, click here. o Stand back from the shoreline and be aware of surroundings. o If fishing from a boat, always wear a life jacket, and ensure boats are seaworthy before going out on the water. o Don't drink alcohol while operating a boat. o Always stay in the boat; water temperatures are low and the risk of drowning because of cold water is high. o If the boat capsizes, remain with the boat where you are more likely to be seen by rescuers. Swim for shore only if wearing a life jacket, if the likelihood of rescue is low, or if you are close to shore and not able to climb back into or on top of the boat. State law requires that boaters always have personal flotation devices for each person, and that they do not drink and operate a boat. Boaters should also be sure their craft is seaworthy before going out on the state's waterways. Follow DEM on Twitter (@RhodeIslandDEM) or Facebook at www.facebook.com/RhodeIslandDEM for more information on recreational opportunities in Rhode Island as well as other timely updates.